LIKE so many American basketballers, Cairns Taipans recruit Demetri McCamey grew up idolising Michael Jordan. 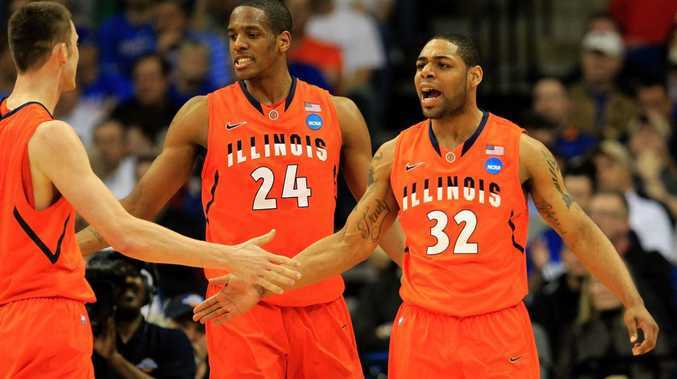 But, unlike many, McCamey got to experience playing alongside the eldest son of 'His Airness', Jeffrey, in the US college system while at the University of Illinois. The 24-year-old also had the opportunity to hone his attacking skills while training against the son of basketball's most famous product. "Being from near Chicago, I was a Bulls fan and I grew up watching Michael Jordan play. I saw him win four of his six championships," McCamey said. "I've known his son Jeffrey since grade 8, and I got to spend three years playing with him while at Illinois - he's a very good defender so I learnt a lot off him at training." McCamey has also been involved with two NBA franchises - playing with the Minnesota Timberwolves in the 2013 Las Vegas Summer League, and was on the Houston Rockets' roster last year. While he did not get any game time at the Rockets, McCamey is undoubtedly an important signing for the north Queensland NBL club, which is looking to atone for missing last season's play-offs. And his new teammates will be interested in hearing his stories of playing back home, where his achievements also included being named a finalist for the prestigious Bob Cousy award - given to the top collegiate point guard spanning all divisions - and finished as only the second player in Big Ten Conference history to post 1600 career points and 700 assists. And like Jordan Snr, Taipans fans should expect the 190cm guard to take the big shots when the pressure is on. "It's the best feeling - your team's going for the win and you make the shot, everyone's excited - the players and fans," said McCamey, who has signed a one-year contract with Cairns. "But it won't be all about me - I'm here to put the team first. I think we can have a really good season, and I want to try to move closer to my dream of playing in the NBA." Taipans coach Aaron Fearne said he believed McCamey's game is sound, after watching him play a number of times in Vegas. "His body of work probably says that he should be one of the league's top guards, but he now has to come out here and prove he can do it," Fearne said.